Monarch Air Group provides private air charter in Hamburg, Germany. Our clients benefit from top-notch service, unrelenting dedication to safety, wide selection of aircraft, and years of experience in chartering private jets. To obtain a free quote, please use our online quoting tool provided below, or call toll free 1-877-281-3051. 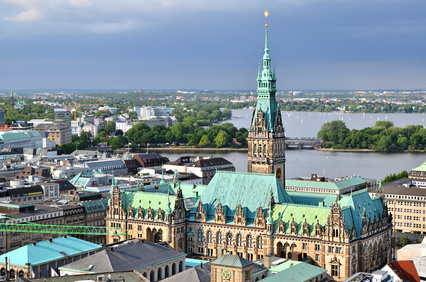 Monarch Air Group offers private jet charter services to and from Hamburg, Germany. Located about 101 km from the open sea on the River Elbe, Hamburg is the second largest city in Germany with a population of about 1.7 million. The biggest harbor city in Germany, Hamburg has served as a main port and trading center for central Europe for centuries. With 1,400 parks and gardens, lakes, a network of tree-lined canals and 2,500 bridges, Hamburg is well known as Germany’s ”green city”. Nowadays Hamburg is a cosmopolitan and dynamic city with big ethnic populations, including many Portuguese and Turkish residents. It boasts many historic Baroque and Renaissance architecture, modern facades, enchanting sightseeing and vibrant nightlife. The most popular tourist attractions include the Altona Fish Market, the Hanburger Kunsthalle, the Hamburg Warehouse Complex, the Blankenese, the Reeperbahn, the Museum of Hamburg History, the St. Pauli district, the St. Michael Church, and the St.Jacobi Church. Hamburg has easy access to nearby cities Bremen, Lubeck, Schwerin, Sylt, and Hameln, and to the seaside and spa resorts of the Baltic and North Sea coastline.